Viking Pump Company is recognized as a world leader in the design and manufacture of rotary pumps. The firm was founded in Cedar Falls in 1911 by Jens Nielsen, a pioneer in the use of the "gear-within-a-gear" principle for pump design. The company's name reflects Nielsen's Danish ancestry. Nielsen developed and manufactured the original pump in 1904 to help remove seepage water from a stone quarry he owned at 18th and Main in Cedar Falls. The pump's success led to the formation of a company with local backing in 1911. There were two employees and $2,000 in sales during the first year in business. The company's original factory building, built in 1912 at 220 East Fourth Street, still stands as part of a greatly expanded complex of buildings. Steady, continual growth through the years finds Viking pumps in use world-wide, delivering a large variety of liquids, including oils, chemicals and food products. Today, the Viking Pump organization includes manufacturing, assembly and sales offices around the world. Viking Pump, Inc. now occupies 100 times its original space and is the largest private employer in Cedar Falls. 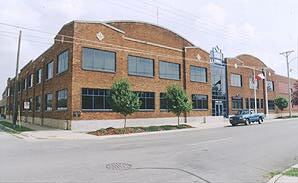 In addition to the State Street location, the firm also operates a castings foundry and production plant on Viking Road in the Cedar Falls Industrial Park. The company was acquired by Houdaille Industries, Inc. in 1968 and was operated as a division of this company for 20 years. In 1988, a restructuring resulted in the creation of the current IDEX Corporation with Viking Pump being one of the original six companies. A large number of fluid handling and related businesses are now part of the IDEX Corporation. Viking was not the first pump manufacturer in Cedar Falls. The Harris and Cole Brothers Company produced wooden hand pumps at a north Main Street location as early as 1889. Some information provided by Viking Pump, Inc. (1998).